We’re officially in fall. I know that much of the country has been in fall for several weeks now, but the desert seasons are a little different. It takes us longer. But it has finally become cooler, the days have shortened and the darkness has lengthened. The air conditioning has been turned off, and the windows are open, the daily breeze flowing through and coating everything in dust. It’s impossible to keep up with the dust in the desert, something I had been warned about previously. It’s not as bad in town but out where we live, where the winds are stronger and the land is more plentiful, the dust drifts in with the breeze and settles on our furniture, books, the floor like a long lost friend. Eventually even cooler temps will arrive though not for long. The numbers will drift down into the 20s and 30s at night. We might get a spit of snow. In the mornings, as we walk the dog, we will wear sweatpants, sweatshirts, and slip our hands into gloves, wrap a scarf around our throats. The temperature of the desert in winter is icy even when it’s not as cold as it feels. This morning, we woke up to a coated sky. Gray and white, the kind of sky that would signal snow in the Northeast or Midwest. It hovers, a sky like this. 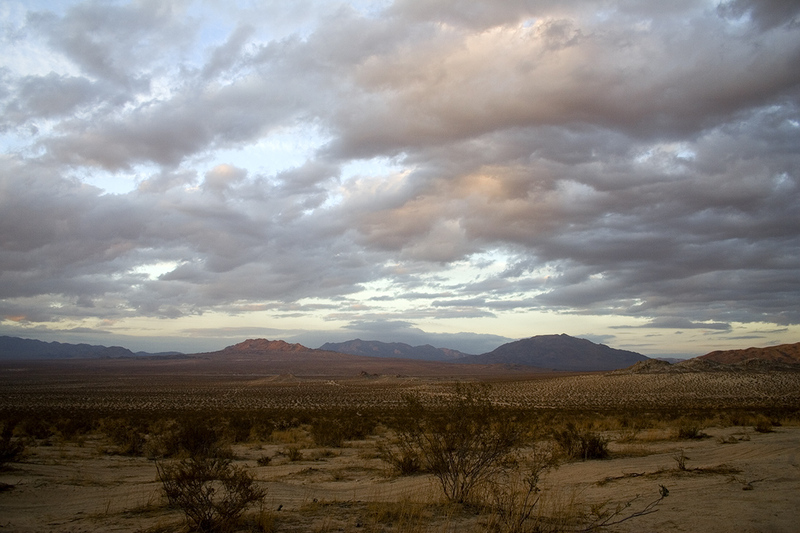 There are no defined clouds, there is simply a seamless blanket covering the city, the county, the desert. The sky up here on the hill is different somehow. Perhaps it’s because we are so sparsely populated. It just seems bigger, and smaller. And today, grayer. When the sky is like this, we seem to sit almost at the same level, like I could reach out and feel the cool of the hovering moisture. I love the gray. I love the way it changes the colors. The greens are muted and quiet, the houses blend more into the landscape. Even those with red-tiled roofs, Mediterranean in style, seem subdued. The black of the pavement softens and becomes more accessible. The sun tries hard to push through but it never quite makes it, and so the desert flattens and softens. It looks almost two-dimensional from up here. It’s a painted landscape that stretches 10 miles or more in every direction except north. North lies the hill. In the gray, it seems closer than ever. There is something about the gray that makes me start to feel the approach of the holidays. Perhaps it’s the diminishing temperatures, or the shorter days. The gray, gauzy sky is what I remember from growing up in the Northeast. A sky like this always ushered in winter and with it, Christmas. The sky doesn’t look like this in the spring or summer. There’s something about the cold that makes the sky cloudier with less clouds. When the sky was this color, we would wait and watch. A single flurry could be cause for celebration. Maybe if it actually snowed and snowed enough, school would be cancelled the next day. It had to snow a lot for that to happen. Now, the gray just allows for cool, and the promise of cold. The weather channel says it might rain. I don’t think it will. This is the kind of sky that settles in for a long nap. It’s in no hurry to do anything or go anywhere. It hovers. In the gray, I find solitude and wonder. In the gray, I can think less of the constant chaos, and more about the world’s potential. In the gray, I find peace. Perhaps the world needs more gray.